There were only two places in my entire journey where I could be certain that I was standing where Nellie stood. The first was the in home of Jules Verne in Amiens, France where I shared his salon, study and winter garden with Nellie. 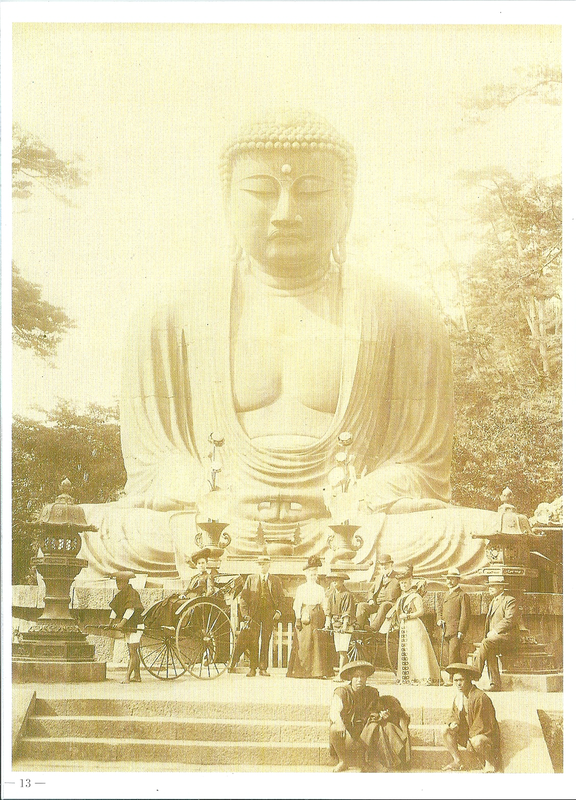 The second was inside the belly of the Great Buddha of Kamakura, Japan. Diabutsu, 50 feet high with a waist circumference of 96 feet, was built in 1250. The size of a 5-story building, he commands the entire region. 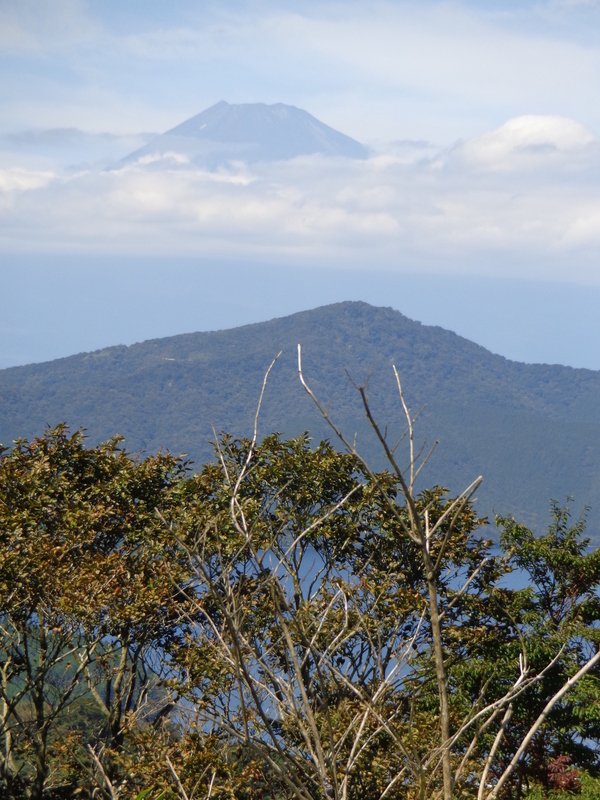 Diabutsu has survived earthquakes and wars that devastated many parts of Japan. He is one of the country’s greatest icons. I had to be content with narrow steps into his hollow tummy. Once inside, along with the graffiti, there are illuminated drawings of how this massive bronze Buddha was cast in 30 separate stages –an amazing feat for the time. Diabutsu’s sofa-sized thumbs. Nellie had her photo taken here. I’d so love to find that photo. Now we must admire Diabutsu’s sofa-size thumbs from a distance. 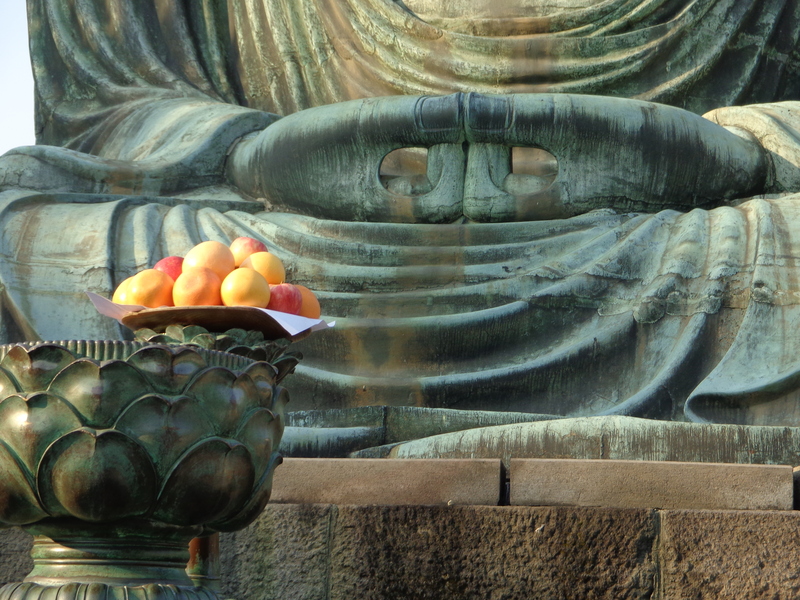 A Buddha-sized bowl of fresh-picked fruit and a spray of autumn flowers lay at Diabitsu’s fingertips. He sits ‘in a verdant valley at the foot of two mountains,’ Nellie wrote. Today the valley — little more than an hour outside Tokyo — isn’t quite as verdant as pilgrims and tourists alike flock to one of Japan’s most popular destinations. I might not have been one of them without the kind invitation of Japanese friends from UNICEF Yoshie and Yoshihisa Togo. 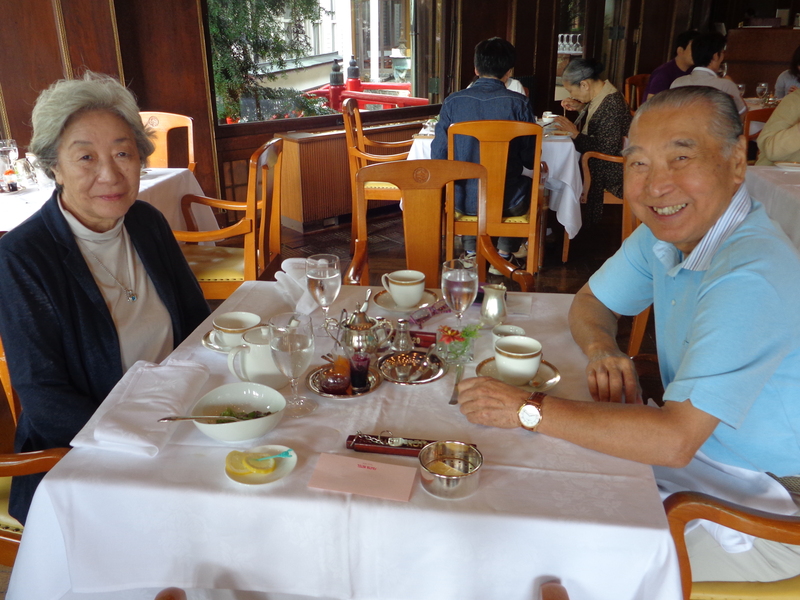 Yoshihisa and Yoshie Togo in the Fujiya Hotel dining room. When I told them that Japan was on my Nellie Bly itinerary, they immediately suggested an overnight trip to the countryside, never knowing that Nellie had been there before me. By the time I reached Japan I was half-way around the world. I’d spent 13 days and nights relentlessly tracing Nellie’s epic journey. I was more than ready to join friends to discover the country she so adored. With Yoshie and Yoshihisa, I travelled to stunning Hakone National Park with its forest-carpeted hills and to-die-for views of Mount Fuji. We stayed in the wonderfully retro Fujiya Hotel built in 1891 featuring onsens (Japanese hot spring baths), a glorious garden with a waterfall, and real live bellhops complete with round caps. The hot spring water flows straight into your bathtub; but I relaxed in the onsen and swimming pool, both reflecting another, more gentle, era. Just being in the lavish dark-wood dining room at the Fujiya was a pleasure; not to mention the Silver Star service and yummy French, yes French, dishes. Savouring Coquilles St Jacques in a period Japanese restaurant with dragon flourishes was wonderfully surreal, especially after a series of in-room picnics on paper towels . My first break from Nellie in two weeks was a welcome one. 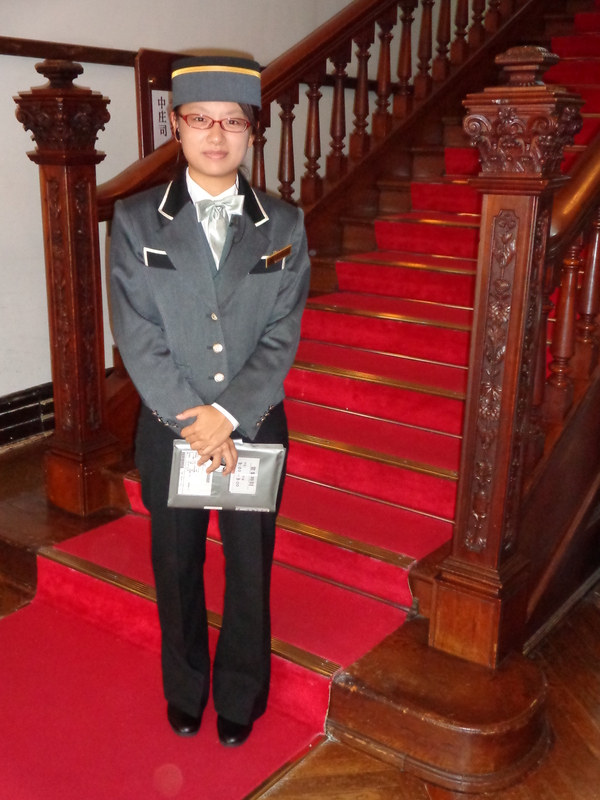 Bellhops look after you at the Fujiya Hotel.